Valworx 524312 air actuated 3-way PVC ball valves are used to control the flow of water and other compatible liquid media (not suitable for compressed air or gas). 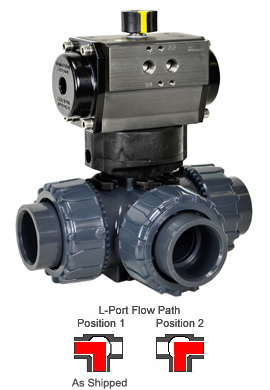 The L-port flow pattern can be used as a diverter valve or a selector valve. Ideal where NSF approved construction is required for potable drinking water as well as other industrial applications. 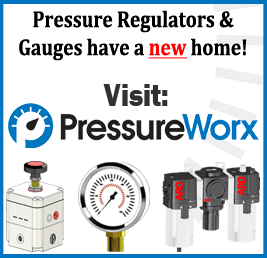 Double acting actuators use an air pressure signal (80-120PSI) to change the valve to position 1 or position 2. Actuator has standard ISO/Namur interface for mounting optional direct mount solenoid valve and other accessories. These actuated ball valves can be mounted in any orientation. Both female NPT and IPS socket end connectors are included with each valve.